Edward Chaney demonstrates how the rich material of the novel was derived quite closely from the ‘grubby and/or gothic goings-on’ of Edwards’s own family … it might be best to read ‘The Book of Ebenezer Le Page’ before the biography of its creator. 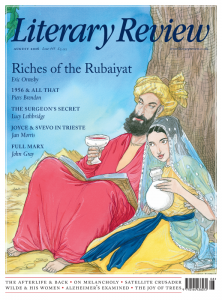 For details of William Palmer’s review in Literary Review – see ‘Guernsey’s Finest’ (subscription required). For details of how to get a copy of Edward Chaney’s Genius Friend: G.B. Edwards and The Book of Ebenezer Le Page – click here. The Book of Ebenezer Le Page by G.B. Edwards is published by NYRB Classics, and is available in all good bookshops.